Did you know that you can use MidlandJobs.ie as your Company Careers Page? Editing your own website can be a pain, especially if it's tricky to make changes or you need to get outside help. Unless you have a person capable of doing it within the organisation, generally it doesn't get done. When it comes to hiring , it means your website is not working for you. It's very possible that prospective employees could be viewing your website daily and not realise you have open positions. We have a solution for this. Why not add a simple Careers link from your site to ours landing on your very own Company page? As you add or edit jobs you don't need to change your main site. This means the person in charge of HR is the only person needed to put your jobs live and linked directly from your main site. We have an SEO backlink to your own site from ours by default so it works for both companies from the start. As you are in full control of the content on MidlandJobs.ie, you can put links to as many relevant pages as you like, e.g. your Facebook, LinkedIn and Twitter feeds. You can advertise your business - our free Careers page is essentially another site capable of promoting your business. It's completely free and you can stop anytime without notice, there is absolutely no hidden gotchas. Lastly and probably the best, Job Seekers can pre-register for job alerts for your company even before you have any. If you expect to have a job vacancy in a few months, set this up now and you could have interested parties ready to receive alerts as soon as you post a vacancy with us. To see this in operation, have a look at www.cows.ie run by David Clarke. 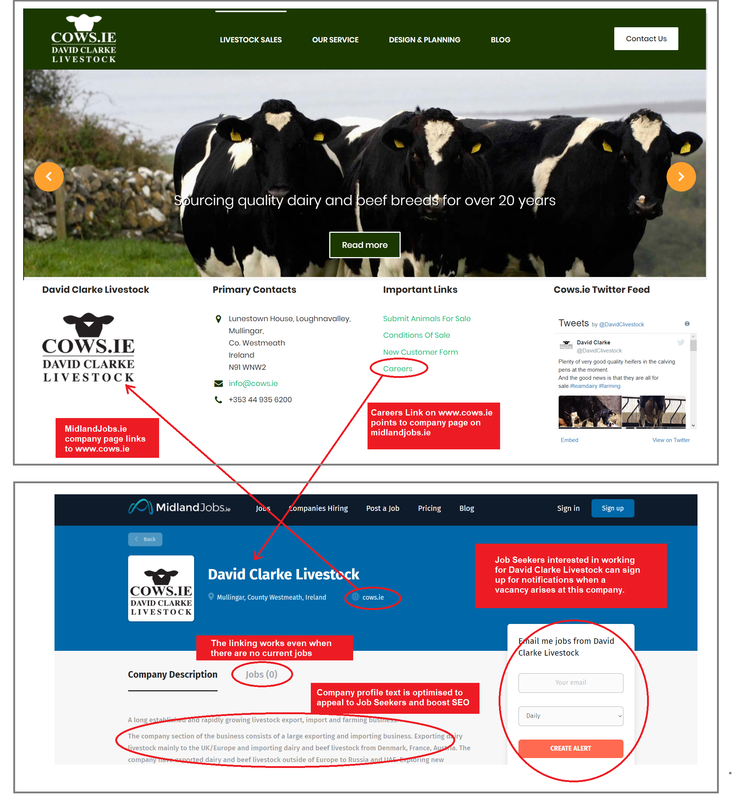 On the bottom of the site there is a Careers link which points to the David Clarke Livestock company profile on MidlandJobs.ie. This is a bi-directional link between the two sites and Job Seekers can view any open positions and apply, or sign up for Job Alerts specifically for cows.ie. This means that from an SEO point of view the MidlandJobs.ie domain is promoting the Cows.ie website. Why not boost your site with a Midland Jobs Careers Link? *If you are adventurous we can supply an RSS feed of your companies open positions which can be listed on your site directly. This may or may not be supported by your site. ** Note this offer is only open to Irish Companies based in the Midlands.